The #ChangeYourMind public awareness campaign, according to their website, aims to educate the general public about the incidence of brain injury and the needs of people with brain injuries and their families. The campaign’s hope is to destigmatize brain injury through outreach within the brain injury community, empower those who have survived brain injury and their caregivers, and promote the many types of support that are available to people living with brain injury. 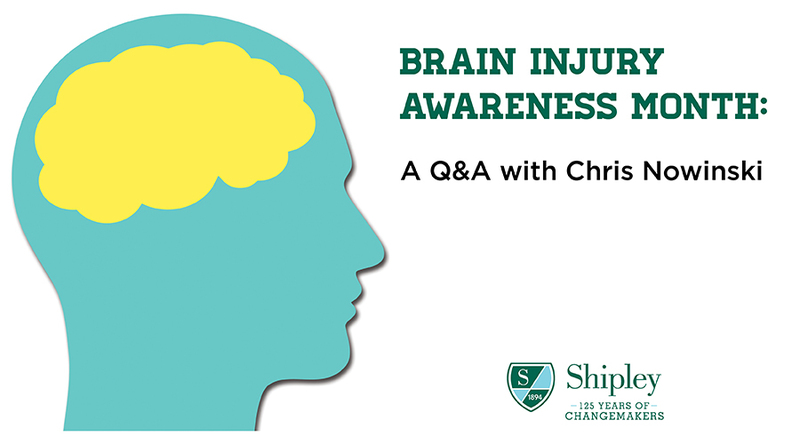 In observance of Brain Injury Awareness Month and joining the Change Your Mind campaign, we spoke to Chris Nowinski, Co-Founder and CEO, Concussion Legacy Foundation (CLF), on the importance of his work and the concussion prevention initiatives that have been implemented at Shipley. Shipley: What motivated you to pursue work in the field of brain trauma? CN: A mismanaged concussion ended my career as a professional wrestler with WWE and left me with over a decade of post-concussion symptoms. As I studied brain trauma trying to find a way to get better, I recognized that the American public was not properly educated on concussions, and set about to change our culture so that we took brain trauma more seriously. Shipley: Why do you feel that the concussion awareness and prevention initiatives that schools like our own have instituted for students are so important? CN: I am so proud to have worked with Shipley over the last few years on concussion awareness and prevention. The dedication you have shown to this issue is unparalleled. This is important because the primary reason schools exist is to develop the brains of their students. That progress can be undone by concussions and repetitive brain trauma. While sports are important for overall health, the athletic staff here at Shipley has taken every reasonable step possible to ensure concussions don’t derail their students’ lives. Shipley: Can you talk more about the “heading policy” that you worked with us to develop for our student-athletes? CN: Attempted headers, often resulting in collisions or falls, are the primary cause of concussions in middle school soccer. In 2015, CLF launched the Safer Soccer campaign with spokespersons like soccer legends Brandi Chastain and Cindy Parlow Cone. The goal was to delay the introduction of heading to age 14, as it’s a risky activity with little reward – it is easier and safer to learn when players are more mature. We were able to convince US Soccer to ban heading before 11, but Shipley was one of only a few programs who had the courage to prioritize brain health over cultural pressure and ban it in middle school. Shipley: Since starting our partnership, have you seen an increase in brain injury and concussion awareness among students, staff, and parents? CN: There is no question that Shipley leadership has changed the culture at the School and received buy-in from every constituency. For my Ph.D. dissertation, I studied brain trauma exposure at three schools, including Shipley. I was quite shocked at how few times Shipley athletes were hit in the head – it actually made my research more difficult. Shipley: At what age do you think parents and schools should begin talking with their kids about concussions? CN: It’s never too early to talk to your children about concussions, beginning with explaining to them that if they don’t feel right after getting hit in the head, it’s important to tell their parent. However, research is not clear that we can truly educate young children. In addition, their understanding of their brain and their ability to understand long-term consequences of brain trauma changes over time, so I’d recommend engaging your child in conversations about concussions in different ways multiple times during their development. Shipley: What advice would you give a parent of a child playing contact sports? What about coaches and athletic directors? CN: I would recommend parents not enroll their child in sports that allow for preventable, repetitive brain trauma before high school. No headers in soccer, no tackling in football or rugby. For high school sports, ensure your coaches believe in limited contact in practice; unnecessary, repetitive head impacts can be dangerous. When it comes to concussions, ensure everyone receives appropriate education, including our Team Up Speak Up program, which encourages coaches to talk to their teams about speaking up when they are worried a teammate has a concussion. Encourage a culture where every possible concussion is taken seriously and goes through a concussion protocol, and athletes don’t return until cleared by the appropriate medical professional. Learn more about the Concussion Prevention Programs at Shipley.